Tall or short, straight or curly. Made using Durum wheat, whole grain, egg and even gluten free ingredients. There’s a pasta for everyone. 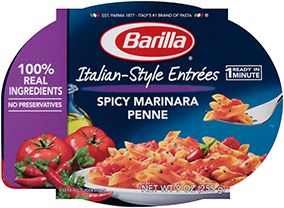 Explore all of our delicious pasta varieties. Just because you don’t have time, doesn’t mean that meal times need to be compromised. Savor a chef quality, Italian style, ready-to-eat meal in 60 seconds.